SCCM 1806 CB Build & Capture TS failing at Prepare OS step | just another windows noob ? I came across this in the windows-noob.com FaceBook group today, so I thought i’d share it with you. have just upgraded SCCM from 1710 to 1806. In addition I have updated ADK and MDT to the latest releases. I am using Microsoft’s latest Windows 10 1803 enterprise WIM from VLSC including the August 18 update. My boot image and task sequence packages (toolkit package, settings package) have been updated. 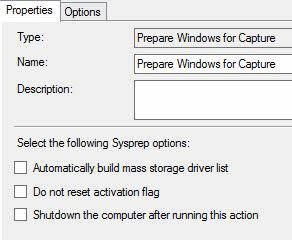 The build and capture task sequence fails at the prepare OS step (see screenshot). The task sequence worked prior to the SCCM, ADK & MDT upgrade. The solution in this case was to replace the ConfigMgr client agent with the SCCM 1806 version, after doing so it’s working again. This entry was posted in 1806. Bookmark the permalink. Great find, can you elaborate on “The solution in this case was to replace the ConfigMgr client agent with the SCCM 1806 version, after doing so it’s working again.” please? hi, this means to replace the client used in the setup windows and configmgr step from SCCM 1710 version to SCCM 1806 version instead, the task sequence was still using the older version of the client from before SCCM got upgraded to 1806. The configmgr client agent points to a package which itself needs to be upgraded.